First announced back in February, Nintendo has just detailed what exactly we’ll be getting with the first batch of DLC that’s being offered for Breath of the Wild in the Summer. From new armour to a fancy “smart map”, it all sounds pretty great. First, and coolest of all, is the addition of a mode to the map which will track where you’ve been over the last 200 hours. It’ll help you see not just where you’ve been, but also where you haven’t, in case you’re hunting for shrines and want to see the areas of the map you haven’t been hitting for whatever reason. Adding to your navigation options is an item called the “Travel Medallion”, which you need to find in a chest. Once you’ve got it, you can set a single point on the map and make it a fast travel point. Which sounds very handy. 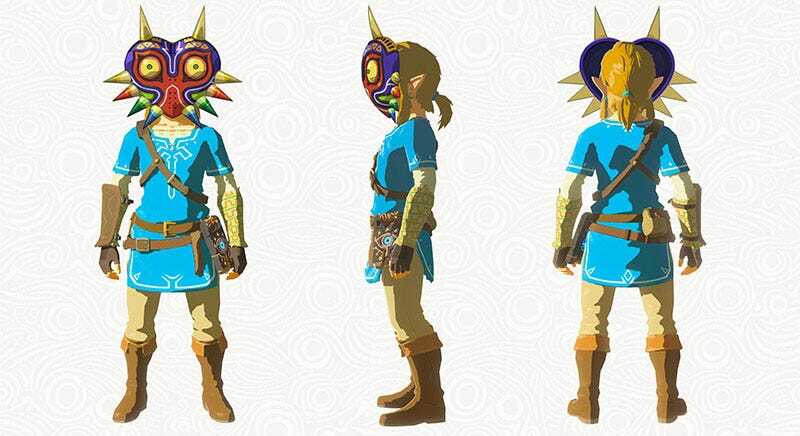 And for those wondering about aesthetics, there will also be new armour that taps into the series’ history, including a replica of Majora’s Mask, Tingle’s outfit and a Korok Mask which “shakes whenever Link is near a hidden Korok location”. Remember, this is the first of two planned pieces of DLC. This one is due this Summer, while the second—which includes an expansion of the story—is coming later. And the only way to get them is to pay $20 for a bundle that includes both.